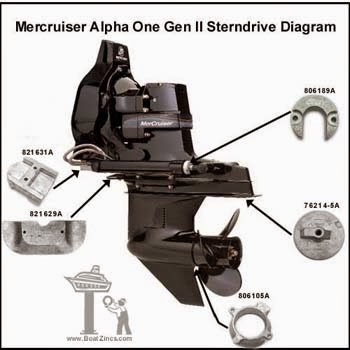 This basic service list will apply to Mercury Alpha Drive Generation 1 or Generation 2 .This is a basic list that the boat owner should be able to complete in the spring before launch. First you must be able to identify your drive type. First of all Alpha drives are single prop only, there is no alpha duo prop. Alpha drives are a smaller in size and weight. You can not identify your drive by the engine alone, Alpha drives came in combinations covering combinations from 4 cylinder (3 litre) to big block V8 motor (454 cyld). 1- On the sides of the bullet directly behind the prop near the front of the case you will locate a large drain screw (photo below c/w gasket) it can be removed with a large flat screw driver, Directly above this drain screw above all of the anti cavitation plates you will locate another identical screw this is the vent screw. 2- Allow the gear oil to drain from the drive this will take at least an hour to complete. The longer you give the drive to drain the better the service will be, do not rush. 3- While the gear oil is draining, it is time to take a look at the anodes these are clearly marked in the drive picture at the top of this post. If they are gone or are badly corrode you will need to change them. Anodes are your front line protection against corrosion. 4- If the drive has some area were the paint is damaged you can prime and paint just these areas, DO NOT unless it is really really necessary sand down the drive and respray the whole thing. Once you do this you will be doing this every year! The products that the drive comes from the factory coated with are the very best and cannot be reproduced. Once these factory coatings are sanded the drive does not have the same corrosion resistance any more. Just touch the drives up even this will start to become an annual thing to do. You will need 4 or 5 one litre containers of gear oil for the job. You will attach the pump to the filler screw hole at the bottom or on the bullet of the drive. 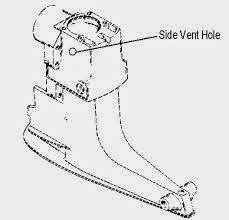 Very slowly pump your gear oil back in the drive please go slow, the reason for this is, the gear oil must push the air out of all the passages on its way up to the vent screw hole. When you see new gear oil at the vent screw hole coming out stop. Waite five minutes and try to pump a little more you may get spits of oil and air at this time, if you do stop and try again after a couple of minutes. The gear oil at the vent should flow out evenly. Once you have determined that the drive is full you will re install the vent screw with a new ring gasket and then the drain screw with a new ring gasket (seal). Photo of vent screw and gasket above. 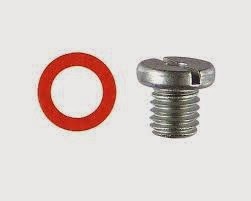 The reason for new seals at the drain screw and vent screw every time you service them is simple these are points were water can access the gear oil. After all the drain screw and vent screws are under the water level. 6- Clean the prop shaft and all of the prop parts with a clean dry rag. Place a thin layer of 2-4-C grease on the prop shaft and re install the prop. Be sure not to over tighten the prop nut. tighten until snug and then grab the prop and try to move back and forth on the shaft you will feel a slight bit of movement from the shaft a couple of millimeters, and then bend back the nut locks, you should only be bending the tabs that line up with the slots in the spacer. 7- On newer boats there is a gear oil reservoir on the top of the motor, you will now need to go in the boat and top this bottle to the operating rang mark.It drains down when the drive is draining. 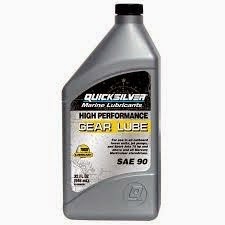 On your first run of the year check the gear oil level in the reservoir on the engine if the drive was filled to fast the drive will consume some of this gear oil and you will need to top the reservoir up again. 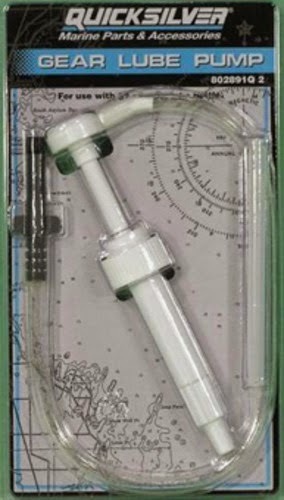 A note about the gear oil reservoir, There is a sensor in this bottle and when the gear oil is low it will send a signal and you will receive a beeping alarm at the helm. Never ignore these alarms they are critical! I have seen many boats were the wires to the reservoir have been cut if this is the case fix the problem do not leave the drive reservoir unhooked or modified in any way, this is how a drive manages to blow up with out any notice. If you do not have a reservoir and alarm system than this service is even more critical, as it is the only way of verifying you have full, good clean gear oil in the drive. A- Contaminated gear oil, this is gear oil that has been mixed with water. If when you drain the gear oil you have fluid that comes out looking like a green milk shake or if when you drain the gear oil there is water which has separated and poured out separately. If this is the case you will need to contact your Mercury Authorized service provider for repair. 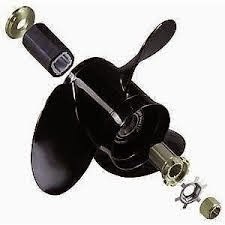 Quite often the problem is fishing line around the prop shaft behind the prop and against the prop shaft seal. B- Over heat problems or poor water flow to the engine, this is probably a water pump kit it is located inside the drive between the upper and lower gear case . The water pump should be serviced at least every two years. C- A clunking sound when you put the boat in gear Call your Mercury Service provider and get this checked there is a universal joint on the drive shaft between the motor and the drive. If you complete this basic service every year you will extend the life of your drive. Copyright 2015 © Boat Nut Media, Toronto, Ontario. All rights reserved. No part of this information/publications may be stored in a retrieval system, transmitted, or reproduced in any way, including but not limited to photocopy, magnetic, or other record, without prior agreement and written permission of the publisher, Boat Nuts Media ©™ No liability is assumed with respect to the information provided. MY COLORED HULL HAS DIED, What can I Do About It?